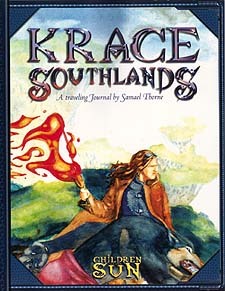 READ the exploits of Samael Thorne, wizard, traveller and writer, as he travels across southern Krace! LISTEN as Doc Ginger presents The Dash and Flash Adventure Hour live each week on 92-01, The Voice of Civilization! EMPOWER yourself with the latest in arcane engineerng, from Professor Deighton's Darksight Goggles to Linksever Crystals! GRAB you longpistols, throw on your longcoat, and prepare for a firefight! ENTER into battle as an Unforgiven Knight of Hathfyr, riding upon a Luparathi mount! EXPLORE the Maze of Ophides, a cavern-like forest where dangers lurk behind every twig! SHRIEK as Inkspiders spill forth and attack! DISCOVER the dark heart that threatens to corrupt this forest kingdom from within!